Athens, ca. 449-413 BC. Silver tetradrachm. Date : The traditionally accepted dating of this style is 449 to 413 BC, but I believe they were probably minted down to at least 407 BC, which is the most likely date for the emergency issue plated coins of this style. Size : 23.7 x 24.3 mm. Weight : 17.20 grams. Grade : gVF and better centered than usual with a significant part of the ;crest showing. Obverse : Head of Athena right. 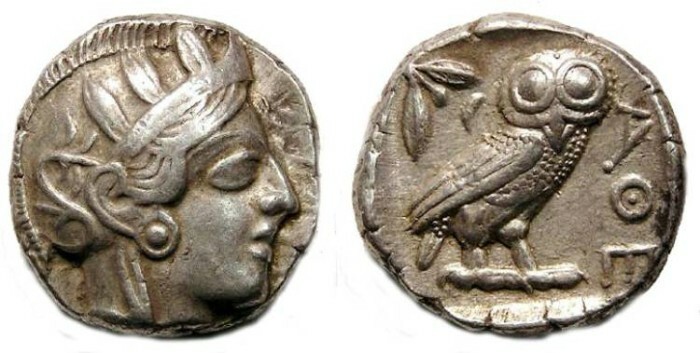 Reverse : Owl standing right, with an olive sprig and crescent moon over its shoulder, with a AQE to the right.